Initially established in 1857, the American Church of Paris draws attention from wanderers on the Seine banks, with its heavy Gothic style and green colored pinnacle. 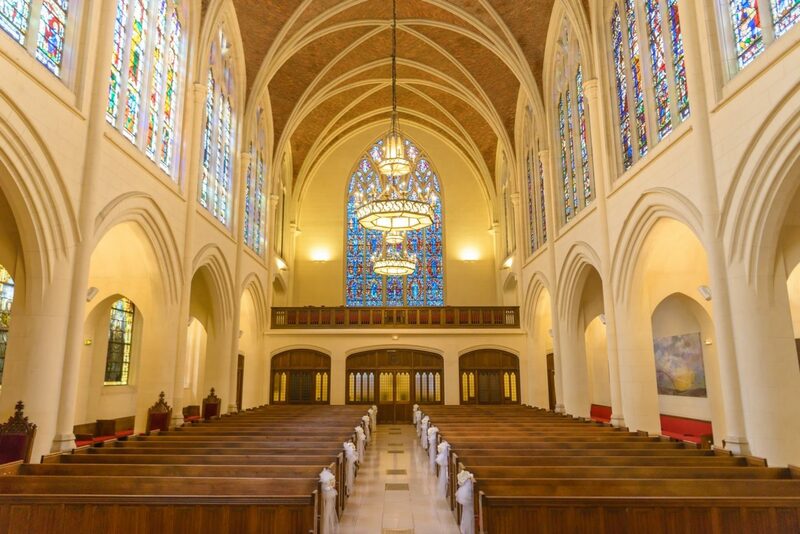 The interior of the chapel is glowing with chandeliers hanging on the ceiling and surrounded by beautiful stained-glass windows. Two of them, offered by Tiffany & Co., are on the list of French national historic treasures. The ceremony starts accompanied with the soulful sound of the church organ, made of 3375 pipes. It includes candle-lighting during the office, and a flower shower after it. All the ingredients to make a heartfelt and unforgettable wedding.